Investors’ trust in the wealth management industry is fragile; only 53% of investors trust investment management firms to do what is right. Worse for advisors, retail investors are less trusting of the industry than their institutional counterparts, with trust at 51% and 61%, respectively. 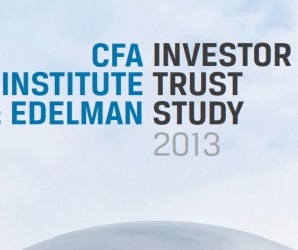 The survey was commissioned by the CFA Institute and conducted by Edelman. Benoit Poliquin of Exponent Investment Management, a fee-only firm in Ottawa, says one reason people may have low trust is that they acknowledge that advisors often don't have their clients' best interests at heart. Investors also expect government regulators to play a significant role in building trust in the capital markets: 52% of investors pointed to national and global regulators as having the greatest opportunity to affect change and enhance trust – far more than those who thought trust could be restored by the efforts of individual investment management professionals (28%) or investment management firms (13%). Since the financial crisis, regulators have gone into overdrive on international and national levels. Reforms included Frank, Basel III, and Solvency II, the Future of Financial Advice (FoFA) bill in Australia, and the Financial Services Bill in the UK. The UK and Australian legislation banned certain commissions and increased fiduciary best interest mandates on advisors; measures Canadian regulators are considering. Such proposed changes are of deep concern for many frontline advisors, at all levels of the industry. Dave Watson, founding partner of Wealth Planning Group in Winnipeg, said changes to the fee model would likely hurt both advisors and clients. While he does not benefit from fees, Poliquin agrees that pushing clients into bank channels would be a boon for the Big Six. In spite of a desire for regulation, investors did not consider that to be their highest priority when selecting an investment advisor. Globally, investors are less concerned with compliance with regulations, or the performance of portfolios, than they are with the behavior of their advisors and financial institutions. Investors worldwide said that trusting an investment manager to act in their best interest is the single most important factor in when choosing an advisor (35%). Achieving high returns was cited as the mpst important factor by 17%, a commitment to ethical conduct by 17%, recommendation by a trusted friend or individual. Only 8% of investors said “compliance with industry best practices” was the most important, and just 7% said the amount and structure of fees. The survey’s administrator says that this means restoring trust in the finance sector will be largely up to frontline professionals such as advisors. That may be a tough job, as the industry has a long way to go in raising its reputation. When investors were asked whether they trusted various industries “to do what’s right” financial services came in at the bottom of the list: 67% of investors trust technology firms, 61% for the food and beverage industry, 60% for pharmaceuticals, 58% packaged consumer goods, 57% automotive, 56% telecommunications, 53% banks and 52% non-bank financial services. The Investor Trust Study surveyed over 2,100 retail and institutional investors in the US, UK, Hong Kong, Australia and Canada.